The Rogue River rises in the Cascade Mountains near Crater Lake National Park and flows through Grants Pass and on to reach the Pacific Ocean at Gold Beach. 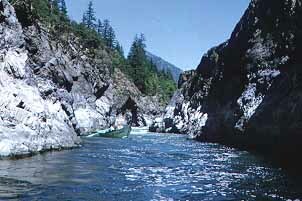 A section of the river below Grants Pass is designated as a National Wild and Scenic River. The Rogue is considered one of the world's classic rivers, home to a vast array of wildlife and whitewater.